Institutes build future leaders of the world, who think beyond academic excellence, believe in working towards social community causes. An Institute with this vision makes a distinctive impact in entire higher education. It is important to understand the nature of digital media and its benefits for society. The changing concept has been driven by XLRI by capitalizing the digital media for the betterment of society. To engage with the audience via community-based initiatives. Promoting the student events and activities of the program. Highlighting the learnings beyond the classroom. Capturing the energy and enthusiasm of the students. 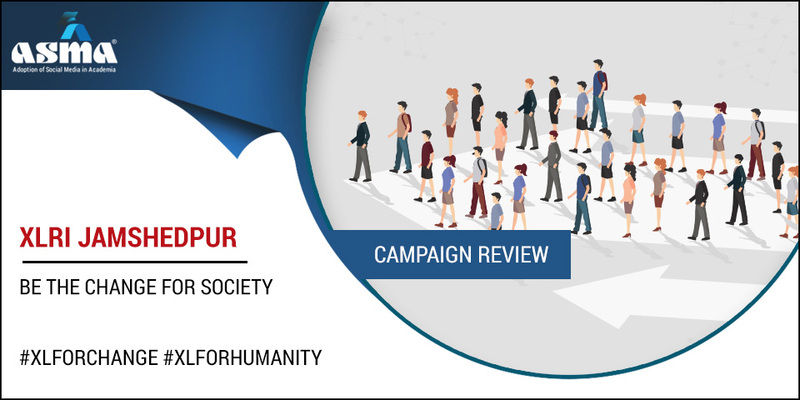 Run a campaign to highlight the student’s activeness and enthusiasm in working towards social causes and how have values been created by the institute. To promote the student’s social initiative over social media platforms. Creating a brand identity with a unique change in approach. The Objective of the campaign was to engage with the audience via a community-based initiative. The strategic approach was to go with #XLForHumanity, #XLForChange addressing the social cause and trying to adopt changes to resolve these causes. The posts and videos were shared on Twitter and Facebook. A Small step towards the betterment of society, makes a huge impact in Higher Education. The concept has been denoted to run a campaign presenting the need of B schools beyond the academic learning. The social cause initiative driven by content marketing actually brought the new waves in the entire social media platform of XLRI. The student-centric approach to provide helping hands to needy one makes the XLRI a brand with versatile learning exposure, where students not only driven by books and but something that can be helpful for society. The campaign was promoted over Facebook with a post stating kick-starts of its Basic Computer Learning Program (BCLP) for the students of class eight from ADL Society High School, Jamshedpur today. Student-driven initiative for captive learning, guiding school mentor to engage students with unique practices. Alumni driven session over the current topics and its impact on society. The eminent personality is being called for delivering a lecture on the latest topics. The Welcome note for Industry Speaker highlighting the importance of the speech and their achievements have been shared. This brought a high level of engagement over the post by likes and shares. Twitter has been a prominent platform to share stories on the change in society by XLRI. The student support system has been developed to fund small initiatives. Post pops for celebrating festivals by creating awareness camp for Eco-friendly system.